Nice. I managed to wedge 6 bottles of Kocour beers in the suitcase, on top of the 11 other bottles. Missus wasn't too impressed, but she managed the case OK.
What beers did you get? 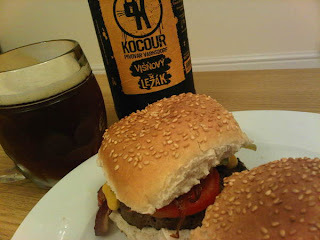 I had the Kocour IPA a few weeks ago and thought it was excellent. Burger and beer are universally great, no matter what the burger or what the beer. You been in the Humphrey Bean of late? Is it true that mad phil lowry has been pushed out as brewer at vinopolis? if so that's a shame. yes, he lacks social skills but his beer was pretty decent! I bought Lezak, English Pale Ale (2 off), Lezak Tmavy, IPA Samurai, Studentska Desitka from Kulovy Blesk in Prague. They had about four Kocour beers, 2 Matuska and a Kout na Sumave Desitka on tap. The best of the bottles was the IPA Samurai, but all the beers were good. I'd definitely look out for these PET bottles for Czech beers in future. The litre bottles weigh almost the same as a half litre glass bottle. The one thing I have noticed wth Czech beers is that they don't tend to keep well (At least the lower strength beers don't). Anon - I disagree! I've been saved by a 'Spoons beer and burger many times!! And only a few quid - bargain! Londonism - I believe has has stopped brewing there but Angelo and Steve are still brewing. They are making some cracking beers so I hpoe they can keep it up! Mark - Great selection of bottles. If you are on twitter then look up Odddogmike as he's trying to export Mutuska and Kocour to the UK! I'd be very happy if he does. We had a couple of pints of the English Pale Ale in Prague and loved it. Had some fantastic Kout na Sumave on draught too. 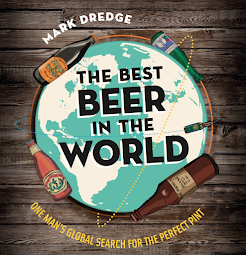 Lovely stuff - you've got me craving a cracking Czech lager now!